When You Believe: Miao Miao!! Location: Straits of Malacca, Malaysia. Sleeping beauty or sleeping snow white? Beautiful cat and very well captured. What a cute kitty!.. Great capture! Such a pretty kitty, lovely photo! Apa khabar KIrstin? That's an adorable cat!Thanks for checking out mine. 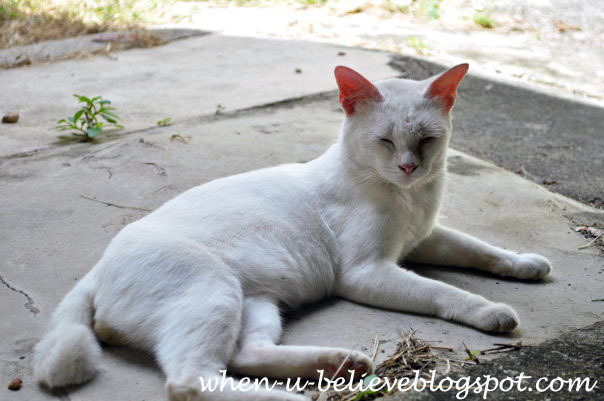 What a beautiful white cat wondering what do you want from him with the camera. Looks like he's getting some shade. Like his pink ears. Lovely cat - is she yours? so sweet and relaxed, loving the sun! What a cute photo! its not mine..my neighbour's.. just took a pic of her while she resting. she got 7 kids!